Labrang Monastery is one of the six great monasteries of the Gelug school of Tibetan Buddhism. Labrang Monastery is home to the largest number of monks outside of the Tibet Autonomous Region. 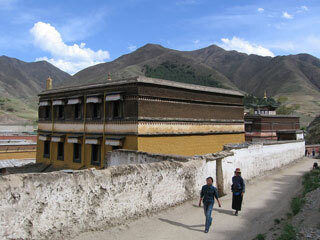 In the early part of the 20th century, Labrang was by far the largest and most influential monastery in Amdo. It is located on the Daxia River, a tributary of the Yellow River. This article uses material from the Wikipedia article "Labrang Monastery", which is released under the Creative Commons Attribution-Share-Alike 3.0 License.